In the Western mind, Asia's Gobi Desert often evokes a sense of an alien world--a remote land marked by awesome and arid landscapes, torrid summers, frigid winters, long extinct life forms, striking modern life forms, epic adventure, spiritual sanctuary and unforgettable travel destinations. The Gobi -- the fifth largest desert in the world -- arcs across the borderlands of northern China and southern Mongolia. Extending for some 1200 miles east northeast from China's Tian Shan, or "Celestial," mountain range into China's Manchurian region, it covers well over half a million square miles, lying in the heart of Asia's most remote region. 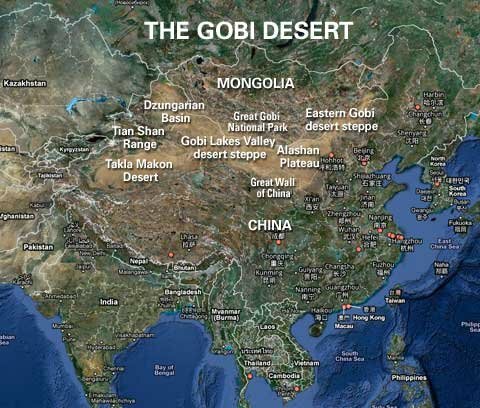 With the elevations of its basins ranging from roughly 1600 to 5000 feet above sea level, the Gobi lies at about the same latitudes as those of central Europe and the northern United States. Its arid climate is attributable to its location, in the rain shadow of the Himalayan and connecting ranges, which intercept moisture-laden clouds before they can reach most of the Gobi. The word "Gobi" means "large and dry" in the Mongolian language. Panorama picture of The Flaming Cliffs, Gobi Desert, Mongolia. Composed from several images taken at sunset on the 8/2/2005 by Zoharby. Across its span, the Gobi -- a sprawling patchwork of a desert basins and mountain ranges -- features primarily a firm and often rocky terrain marked by gravels and sparse vegetation. It has relatively few sand dunes, with those having been formed through time under the forces of persistent windstorms or heavy erosion. Its harsh terrain discouraged significant human occupation for thousands of years. Alashan Plateau -- Located south and southwest of the Eastern Gobi Desert Steppe, the Alashan Plateau covers some 260,000 square miles. The largest of the Gobi's ecoregions, it has a terrain of 6500- to 8500-foot-high mountain ranges interspersed with intermontane basins. In its southern basins, it has 650- to 1000-foot-high shifting sand dunes. 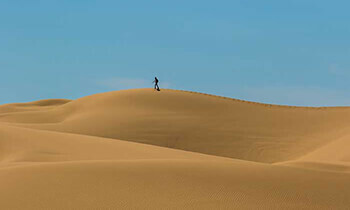 In its northern regions, it has the typical Gobi barren, rocky landscape. The plateau may receive as much as six inches of rainfall in a year, although the precipitation varies widely both in place and time. In the southern, drier part, it may receive no rain at all for years. The plateau does have a few rivers near its eastern edge, and it has numerous oases (fed primarily by mountain snowmelt) in its basins. As in the Eastern Gobi Desert Steppe, the plateau's temperatures vary widely with the seasons. It has an extraordinary diversity of wildlife, with some species native only to the plateau. Its plant community varies from minimal vegetation in the stone-covered areas to scattered shrubs and grasses in the most arid areas to forests along the rivers to reed beds in the low-lying wetlands. The Great Gobi National Park, located in Mongolia, in the northern part of the plateau, has such exceptional biodiversity that it has been listed in the United Nations Educational, Scientific and Cultural Organization (UNESCO) World Network of Biosphere Reserves. Gobi Lakes Valley -- Situated to the north of the Alashan Plateau, the long and narrow Gobi Lakes Valley, covering about 53,800 square miles, lies in the midst of several mountain ranges. 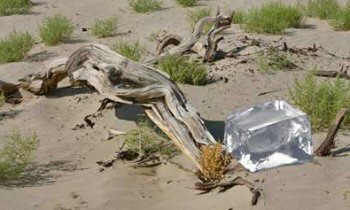 Averaging about 3300 to 4500 feet in elevation, the valley has a few sand dunes interspersed with salt marshes, and it has several large, but often dry, lakes fed by intermittent rivers that rise in nearby mountains. The valley receives some two to eight inches of rain in an average year. It has dry, windy summers with comparatively moderate temperatures, and it has moderately cold winters, with temperatures that sometimes approach zero degrees Fahrenheit. Its wildlife community includes species adapted not only to the arid landscape but also to the wetlands, where water birds, amphibians and various reptiles have found a home. Similarly the plants include species adapted to both the desert steppe and the wetlands environments. Junggar Basin (Dzungarian Basin) -- A 117,500-square-mile expanse west of the Alashan Plateau, the Junggar Basin, somewhat like the Gobi Lakes Valley, lies in the midst of several mountain ranges, with broad openings to the northwest. 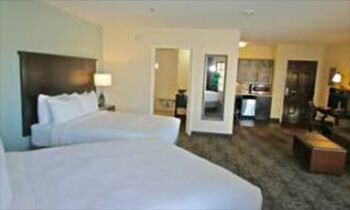 Its elevation ranges from about 1600 to 3300 feet above sea level. Its arid heartland receives about three to four inches of precipitation in an average year, supporting enough vegetation to stabilize most of its sand dunes. Its margins, near the mountain ranges, receive four to ten inches of precipitation, which, with mountain runoff, sustain several basin lakes. It has moderate summers, but icy winters, when Siberian weather systems sweep through the northwestern openings and across the basin. It sometimes has severe dust storms in the spring. Its wildlife population includes some of the world's rarest animals. Its plant community ranges from thin shrub lands of the central region to dwarf woodlands near the mountain flanks. At one time, near the mountains, it had biologically rich meadows and wetlands near the foot of the mountains, but those have given way to irrigated farmlands within the past few centuries. Tian Shan Range -- The westernmost of the Gobi Desert's ecoregions, the Tian Shan Range covers some 49,800 square miles. It consists of an extensive and isolated mountain range and high ridges interlaced with desert basins. Its highest summits rise to nearly 25,000 feet in elevation, and its ridges, to an average of about 14,000 feet. Its lower foothills and basins lie at only a few hundred feet in elevation. In an average year, the higher elevations receive about 16 to 32 inches of precipitation, and lower elevations, only about 4 to 8 inches. Mountain peaks may retain snow all year, but they yield enough summer melt off to supply some rivers and streams. 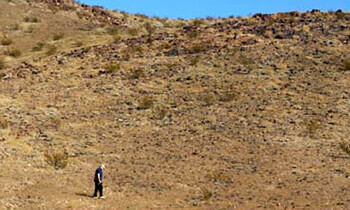 The lower desert elevations have hot summers and icy winters. As a result of the wide range of elevations and environments, the Tian Shan Range sustains diverse wildlife and plant communities. It has a number of rare animal species, some native only to the region. Its desert basins support thin stands of sage and salt-tolerant shrubs; its rivers, savannahs with shrubs, grasses and popular trees; its lower mountain flanks, stands of fruit trees and maple; and its higher mountain flanks, forests of aspen. 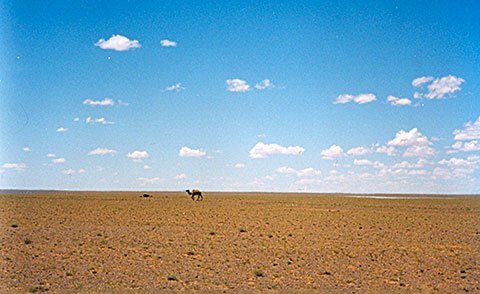 Unfortunately, to some extent, all the Gobi's ecoregions have suffered from human intrusions--for instance, overgrazing, irrigation agriculture, overhunting and mineral exploitation. Further, the desert appears to be expanding, raising concern in many quarters. Various wildlife species may be facing extinction.